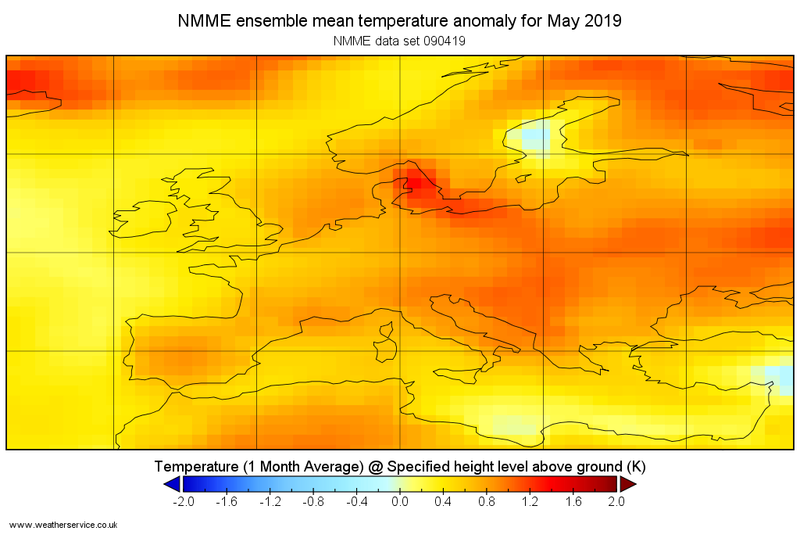 UKMO 110419 - 16th April to 10th May 2019 - Eastern area startingh mainly dry and bright but western areas more cloudy with risk of rain. Slightly unsettled weather spreading to most parts with rain or showers and drier spells. Temperatures trending to normal or slightly above but may be rather warm in some SE parts at times. 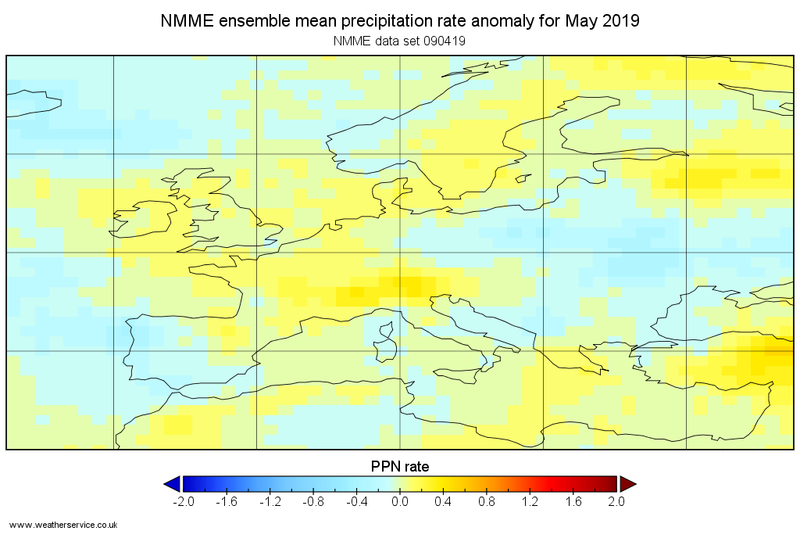 UKMO 020419 - 7th April to 1st May 2019 - A good deal of dry weather although a risk of showers in places, initially in the SW and NE, later S and E. Some longer settled periods probable. Initially near normal temperatures, locally rather cold in some eastern parts, but trending normal to above normal or warm later, though still with a risk of some night frosts. 28day mean - Temp above normal PPN W/NW above elsewhere below PMSL above normal (Slack S). 20-16 TEMP: above normal PPN: below normal PMSL: above normal (slack). 27-10 TEMP: above normal PPN: below normal PMSL: above normal (slack). 28day mean - Temp above normal PPN below normal PMSL above normal but far SW may be below (Slack S). 6A-12 TEMP: above normal PPN below normal PMSL above normal but far SW may be below (Strong SE). 13-19 TEMP: above normal PPN: SW UK and SW Eire above normal elsewhere below PMSL: NE above SW below (Slack SE). 20-3M TEMP: above normal PPN: above normal PMSL: above normal (Slack N). 28day mean - Temp above normal PPN below normal PMSL above normal (slack W, H in S). 30-5A TEMP: below normal PPN: below normal PMSL: above normal (H to W with N'ly over UK). PPN : above normal but S may be below. 1A-10 TEMP: above normal but 40% prob below in N and NW half of UK and Eire. 5A-14 TEMP: slightly above but slightly below in NW and Eire. PPN : above normal but Eire and parts of NW may be below. PPN : 60% prob below 40% above. April single issue forecasts issued late March/early April. PPN : Normal 4/9 below 5/9 mainly in W or NW elsewhere normal.